Using recyclable cartons is just one step in the battle to reduce waste on earth. While you are providing your customers with the means to recycle the packaging, they have to be motivated to do so. While you don’t really have any way of knowing how many of your customers are recycling their cartons, you can take some steps to ensure that they are at least exposed to the idea. One of the best ways to encourage your customers to recycle their cartons is to advertise that you are using recyclable materials. You can advertise your recycling efforts on your website and in any literature that you distribute such as catalogues and mailers. 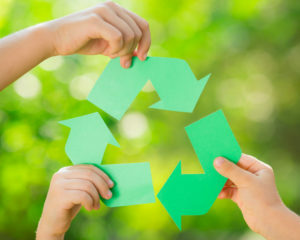 Make it a selling point that your company uses recyclable cartons for your product distribution so that people who are earth conscious will be more likely to purchase from you. When you ship out your product, you can include a reminder to the customer to recycle the carton. The reminder could be printed on the outside of the box. You can also include a note to recycle the carton at the bottom of the invoice or packing slip. An additional small piece of paper included inside the carton could also serve as a reminder. Do not use tape or stickers on the cardboard to remind the customer, as these cannot be recycled and can keep the carton from being recycled. If you are looking for ecofriendly cartons for your manufacturing and distribution efforts, contact us today for more information. All of our cartons are recyclable cardboard or paperboard. We can also help you find more ways to encourage the recycling of cartons. ← Recyclable Cardboard and Paperboard: What’s the Difference? The V-System is a mechanically driven, intermittent motion vertical cartoner for erecting, loading and closing top load cartons at speeds of up to 40 cartons per minute. ECONOCORP Inc. is a recognized worldwide leader in cartoning, tray forming, and casepacking for moderate and lower production volumes. Copyright 2015-2019 EconoCorp Inc. All Rights Reserved.